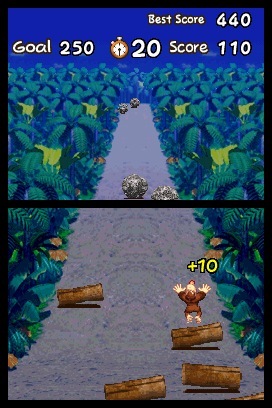 Donkey Kong has been through a lot over the years. When he first made his appearance, he was working hard to try to stop Mario from rescuing Pauline, essentially a villain. Later he was given a makeover and became the protagonist, smashing barrels and riding rhinos for Donkey Kong Country. He leapt to 3D with the sole purpose of collecting endless bananas in Donkey Kong 64, and he tried his hand at villainy once more in the Mario vs. Donkey Kong series. 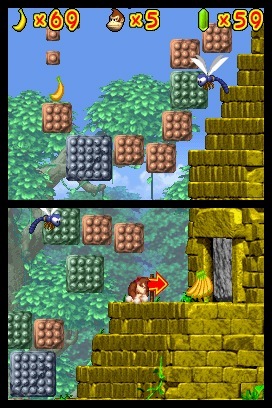 In his latest adventure DK Jungle Climber, DK has to face the horror of a world invaded by round pegs. As you might expect, he decides to overcome this obstacle by climbing and swinging around. As a sorta half-sequel, half-remake of DK: King of Swing for the Gameboy Advance, this game might not seem that different at first glance. You're still grabbing conveniently placed pegs to "toss" yourself around the stage, collecting all sorts of items as you make your way to the goal. In true Donkey Kong Country fashion, you'll find letters to spell KONG, bananas, coins and more. The idea comes into its own in how you climb, which unlike most games isn't just a matter of putting yourself on some rope or vine and pressing "up." The L and R buttons on the Nintendo DS act as your hands, and it is with them you must grab the pegs in order to progress. If you hold L and R at the same time, you'll hold yourself still, and if you only hold one of the buttons you'll swing around ready to launch. Additionally you can press A to to perform an attack which will help you smash barrels or enemies. The strategy involves properly aiming yourself at where you want to go, to pass any number of obstacles. While it may seem like such an innovative concept would be right at home utilizing all of the DS many functions, it actually doesn't do much with it. You can use the touchscreen to activate an invincibility power up, and of course to play some of the mini-games the title is packed with. Besides that, the only other unique DS feature it uses is the dual screen by having the level open up on both sides. Outside of these differences from the GBA version, there is a final major change developer Paon Corporation decided to implement. The original was often derided for its "interesting" cartoon interpretation of the DK world, and here you'll find none of that... it's much closer to the Donkey Kong Country pre-rendered 3D days. Whether or not you find this is a positive thing is largely up to preference. This fall is absolutely packed with gaming goodness, so it may be hard to fit every compelling title into your play library. DK Jungle Climber is a unique videogame that is trying desparately to be noticed, and hopefully the results are worthwhile when it releases on September 10th.